*Disclaimers: Winner will receive a 24 month, low mileage lease on a Cruze, Trax, Equinox or the like thereof. Any other incidental expenses on prize not specified herein are the winner’s sole responsibility. 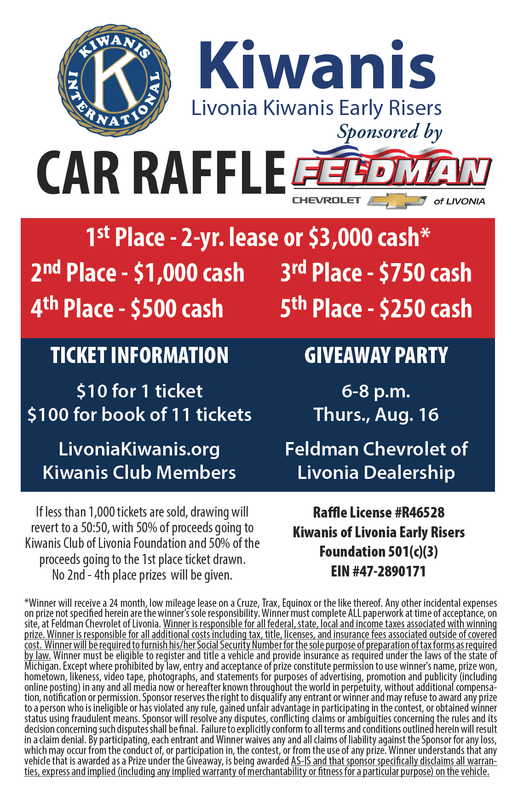 Winner must complete ALL paperwork at time of acceptance, on site, at Feldman Chevrolet of Livonia. Winner is responsible for all federal, state, local and income taxes associated with winning prize. Winner is responsible for all additional costs including tax, title, licenses, and insurance fees associated outside of covered cost. Winner will be required to furnish his/her Social Security Number for the sole purpose of preparation of tax forms as required by law. Winner must be eligible to register and title a vehicle and provide insurance as required under the laws of the state of Michigan. Except where prohibited by law, entry and acceptance of prize constitute permission to use winner's name, prize won, hometown, likeness, video tape, photographs, and statements for purposes of advertising, promotion and publicity (including online posting) in any and all media now or hereafter known throughout the world in perpetuity, without additional compensa­tion, notification or permission. Sponsor reserves the right to disqualify any entrant or winner and may refuse to award any prize to a person who is ineligible or has violated any rule, gained unfair advantage in participating in the contest, or obtained winner status using fraudulent means. Sponsor will resolve any disputes, conflicting claims or ambiguities concerning the rules and its decision concerning such disputes shall be final. Failure to explicitly conform to all terms and conditions outlined herein will result in a claim denial. By participating, each entrant and Winner waives any and all claims of liability against the Sponsor for any loss, which may occur from the conduct of, or participation in, the contest, or from the use of any prize. Winner understands that any vehicle that is awarded as a Prize under the Giveaway, is being awarded AS-IS and that sponsor specifically disclaims all warran­ties, express and implied (including any implied warranty of merchantability or fitness for a particular purpose) on the vehicle. If less than 1,000 tickets are sold by August 10th, drawing will revert to a 50:50 drawing with 1 Grand Prize winner and no additional prizes awarded.